So, there’s two hundred grand burning a hole in your pocket, and you’re keen to extinguish the flames by purchasing a premium, full-size, high-performance sedan. 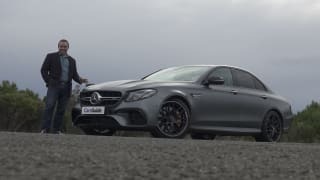 Thoughts turn to Germany; specifically, the bruising BMW M5 and the storming Mercedes-AMG E63. Both can tear the tarmac off the road thanks to outputs in the ‘getting on for 600 horsepower’ range, and dynamic systems finely honed by unhinged boffins in Munich and Affalterbach. But what if you prefer to follow a less-predictable path? One that sends you due south to Modena in Northern Italy, the home of Maserati. This is the Maserati Ghibli, specifically the new S version, offering more power and torque than the standard issue. It’s the famous Italian brand’s take on a serious sports sedan. But the elephant-sized question in the room is, why choose the road less travelled? What does this Maserati have that BMW or Merc’s finest doesn’t? For 2018, the Ghibli is available in two new trim levels. Add $20k to the ‘standard’ price tag and you can choose between the GranLusso, with a focus on luxury (including the option of a Zegna silk interior treatment! ), or the more performance-focused GranSport you see here, the high-output S version, resplendent in ‘Blu Emozione’. Some exterior touches separate the S GranSport from other Ghibli variants. The GranSport is identified by its unique front and rear bumpers, as well as a chrome concave grille, with two wings and a prominent splitter underneath it. More recent Maserati design signatures, including three stylised vents in the front guards, and aggressively angular (adaptive LED) headlights, merge with classic references like delicately formed trident badges on each C-pillar to form a distinctively dynamic exterior. It’s aerodynamically slick, too, boasting a low 0.29 drag coefficient (down from 0.31 for the 2017 car). The styling really sets the Ghibli apart from the Germans. Then you open the door and step inside. In this case, the bright-blue exterior is matched with a black and red interior. Make that mostly red, in fact mostly very red leather on the seats, dash and doors, with trademark touches like the oval-shaped, dash-mounted analogue clock, hooded instrument binnacle, and racy alloy-finish pedals setting the tone. Taking a different path to its Teutonic competition, the Ghibli S dash and centre console combination manages to blend gentle curves with an occasional sharp turn. Cover over the trident badge and other brand giveaways inside, and it doesn’t feel like the usual suspects. It‘s a distinctive, characterful design. The interior isn't afraid to blend curves with the occasional sharp turn. Also worth calling out is the fact that when you crack the bonnet open to impress your friends they’ll actually be able to see the engine, or at least major parts of it. Like alloy cam covers, complete with Maserati in old-school cursive script in the casting. Yes, there’s some plastic dressing on top, but the ability to lay your eyes on real metal warms the heart. Front-seat passengers enjoy a spacious feel, thanks largely to the dashboard’s progressive slope towards the windscreen, rather than the hard-edged, upright layout more commonly found in high-end sedans. There are two cupholders in the centre console, but locating anything bigger than a piccolo latte in them would be a struggle. Same goes for the doors. Yes, there are storage bins, but forget water bottles or anything much thicker than an iPad (in a Gucci slipcase of course). 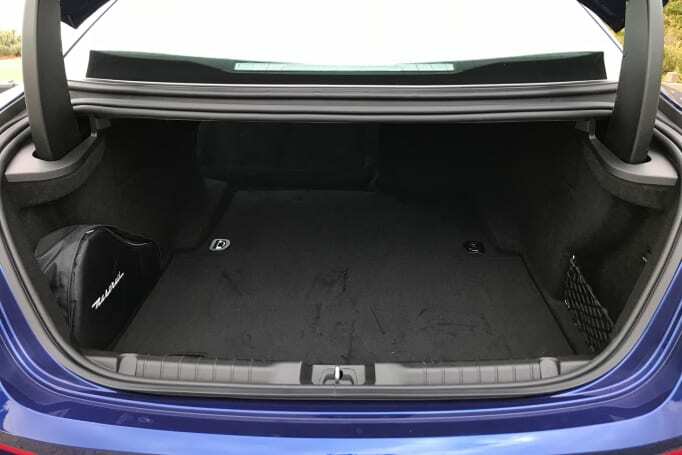 That said, there are several covered storage boxes in the centre console, as well as multiple connection options including an ‘auxiliary in’ socket, USB port, SD card reader and 12v outlet, plus a specific drawer for your mobile (in place of a now-deleted DVD player). Although it doesn’t look it, at close to five metres long and two metres across, the Ghibli S is marginally longer, and wider, than the M5 and E63 (line ball on height). No surprise then that rear space is generous. I was able to sit behind the driver’s seat, set for my 183cm height, with plenty of legroom and more than adequate headroom. The gap for your feet under the seat in front is kinda squeezy, but it’s nowhere near a deal-breaking issue. Three large adults across the rear is do-able, but tight. There's 500 litres of cargo capacity in the boot. There are two adjustable vents for rear-seaters, map pockets on the seat backs, small door bins, plus a neatly configured storage box and (small) twin cupholder combination in the folding centre armrest. The rear seat backs split-fold 60/40 to increase the standard 500-litre cargo capacity and improve load flexibility. There’s a 12v outlet, a side net pocket, and decent lighting back there, too. But don’t bother looking for a spare, a repair kit is standard issue, and an 18-inch space saver is an option. 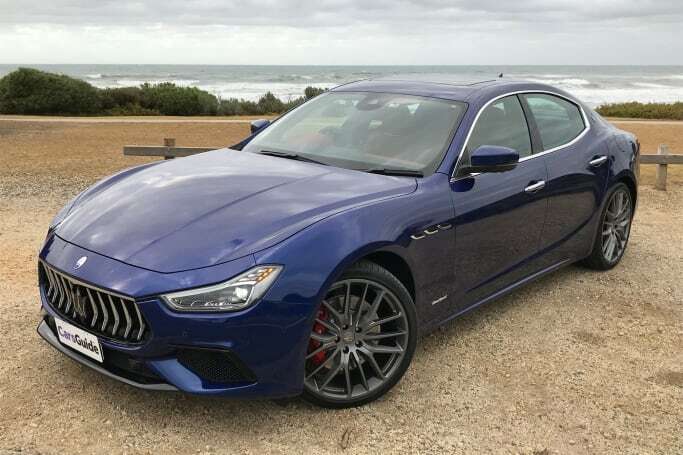 Cost of entry to this exclusive Italian club is $175,990 (plus on-road costs) for the Ghibli S, with an additional $20,000 opening up the choice of Ghibli S GranLusso or S GranSport ($195,990). No small chunk of change, and in the same territory as the M5 and E 63, so what does that mean in terms of standard spec and tech? For a start, the S GranSport rolls on 21-inch ‘Titano’ alloy rims, and features an eight-speaker, 280-watt Harman/Kardon sound system (including DAB digital radio). You’ll also luxuriate in extended leather trim (including a leather-wrapped sports steering wheel), carbon and piano black interior highlights, 12-way power-adjustable and heated front seats, keyless entry and start, sat-nav, LED headlights, power rear window sunshades, power boot lid (with hands-free mode) and soft-close doors. 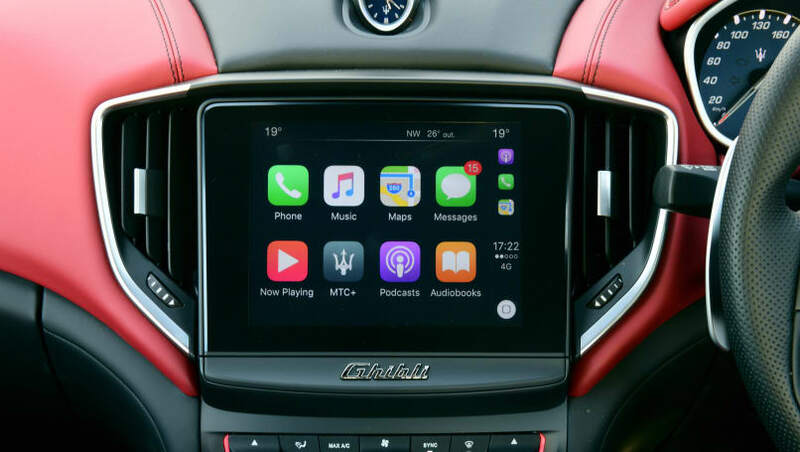 The 8.4-inch colour multimedia touchscreen is packed with with Apple CarPlay and Android Auto. There’s also dual-zone climate control air, cruise control, front and rear parking sensors, a rear-view camera (plus surround view), rain-sensing wipers, a sunroof, ambient lighting, alloy-finish pedals, a 7.0-inch TFT instrument display, and an 8.4-inch colour multimedia touchscreen with Apple CarPlay and Android Auto present and accounted for. That’s plenty of luscious fruit, which is cost-of-entry in this rarefied market territory. The Ghibli S is powered by 3.0-litre, 60-degree, twin-turbo V6 petrol engine, designed by Maserati Powertrain in Modena and manufactured by Ferrari, just up the road in Maranello. 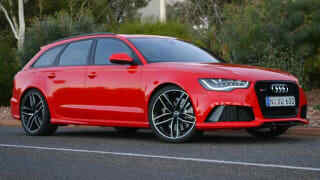 The twin-turbo V6 produces 321kW/580Nm, and thankfully you can see more than just plastic under the hood. It’s an all-alloy unit featuring direct-injection, variable cam timing (inlet and exhaust), low-inertia parallel turbos, and a pair of intercoolers. While it can’t match the powerhouse Germans on outright numbers the Ghibli S still produces just over 321kW, or around 430 horsepower at 5500rpm, and 580Nm of torque from 2250-4000rpm. That’s a boost of 20kW/30Nm over the outgoing Ghibli S.
Drive goes to the rear wheels via a ZF-sourced eight-speed automatic transmission. Claimed fuel economy for the combined (ADR 81/02 - urban, extra-urban) cycle is 9.6L/100km, emitting 223g/km of CO2 in the process. And you’re looking at 80 litres of 98RON premium unleaded to fill the tank. Start-stop is standard. So, the first thing to say is the Ghibli S GranSport is fast, but it’s not in the same eye-widening league as the M5 and E63. 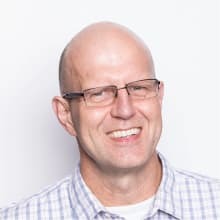 The sprint from 0-100km/h is covered in 4.9 seconds, and if you’re game (and your driveway is long enough) claimed maximum velocity is 286km/h. For reference, the just released (F90) M5 is claimed to hit triple digits in 3.4sec, and the E 63 in 3.5. The V6 turbo sounds nice and growly in the Sport setting, the soundtrack controlled by pneumatic valves in each bank of the exhaust. In ‘Normal’ mode, the bypass valves are closed up to 3000rpm for a more civilised tone and volume. Maximum torque is available across a useful band from 2250 to 4000rpm and the twin-turbo set-up helps with linear power delivery, while the eight-speed auto is quick and positive, especially in manual mode. The sports seats (12-way electric adjustable) feel great, a 50/50 front to rear weight distribution helps the car feel balanced, and the standard LSD helps put power to the ground without fuss in tight going. And despite a 1810kg kerb weight, it does, in fact, manage to feel lighter and more involving than its high-profile, highly powerful German rivals. Braking is courtesy of big (red) Brembo six piston calipers at the front, and four piston at the rear on vented and cross-drilled rotors (360mm front/345mm rear). They’re up to the task, and the claimed 100-0km/h stopping distance is impressive at 36m. The new electrically assisted power steering (a first for Maserati) is light at parking speeds, but it points nicely and road feel improves as the speedo needle twists to the right. Suspension is double-wishbone front, five bar multi-link rear, and despite big 21-inch rims wrapped in high-performance Pirelli P Zero rubber (245/35 front-285/30 rear), ride comfort is amazingly good, even on patchy surfaces. Maserati’s ‘ADAS’ (Advanced Driver Assistance Package) is standard on the Ghibli S, and now includes lane-keeping assist, blind-spot monitoring, and traffic-sign recognition. There’s also AEB, forward-collision warning, ‘Advanced Brake Assist’, ‘Rear Cross Path’ and a tyre-pressure-monitoring system. The 2018 Ghibli and larger Quattroporte sedan are also the first Maseratis to feature IVC (Integrated Vehicle Control), a tailored version of ESP (Electronic Stability Program), using a smart controller to predict driving situations, adapting engine speed and torque vectoring (by braking) in response. The ‘Maserati Stability Program’ (MSP) also wraps up ABS (with EBD), ASR, engine brake torque control, ‘Advanced Brake Assist’ and a hill holder. In terms of passive safety the Ghibli is equipped with seven airbags (front head, front side, driver’s knee, and full length curtain) as well as anti-whiplash headrests. There are three top tether points across the rear for child seats, with ISOFIX anchors in the two outer positions. Although ANCAP hasn’t assessed the Ghibli it rates a maximum five stars from EuroNCAP. Maserati supports the Ghibli S GranSport with a three year/unlimited km warranty, which is now some way off the industry leading eight years (160,000km) from Tesla, and seven years (unlimited km) from Kia. 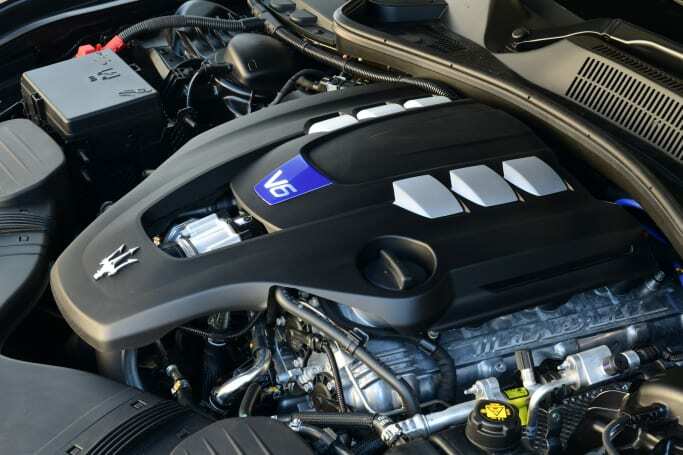 But the recommended service interval is a lengthy two years/20,000km, and the ‘Maserati Maintenance’ program offers pre-paid schedules for Ghibli and Quattroporte owners, covering required inspections, components and consumables. 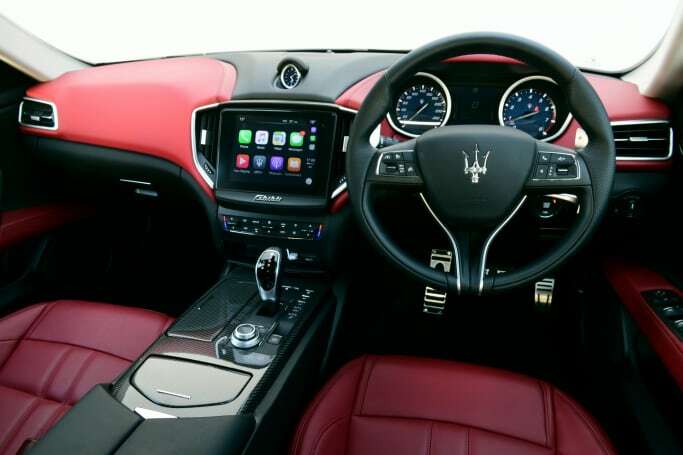 Maserati will tell you people are drawn to its motor-racing heritage and sporting DNA, and that the Ghibli offers something different in a world of grey, business-like conformity. There’s no doubt the M5 and E63 are left-lane autobahn hot rods, stunningly fast but relatively remote. The Ghibli S delivers a more nuanced driving experience. And the design details all through the car actually do connect with the brand’s history. So, before you go Deutsche you might want to think about a high-emotion Italian relationship. 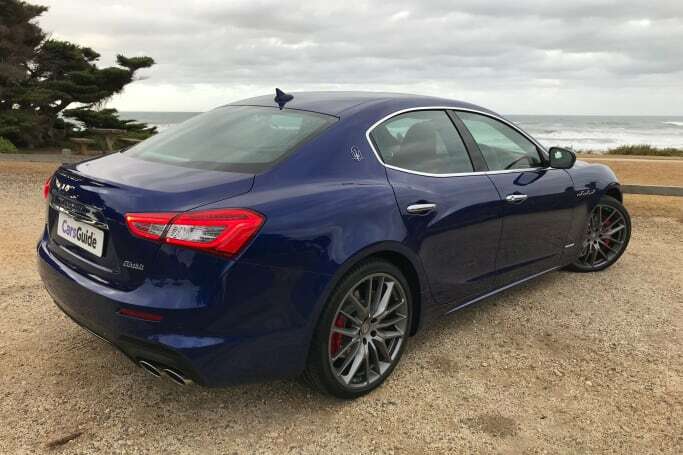 Does the Maserati Ghibli S GranSport's dynamic character put it at the top of your premium performance sedan wish list? Tell us what you think in the comments below. 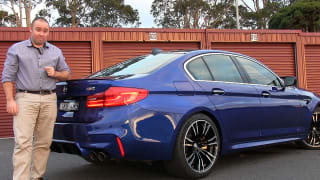 The pressure for German super saloon supremacy is on the new M5 big time. Will the M5 vs E 63 debate become the next Coke vs Pepsi, Prince vs Michael Jackson, or Holden vs Ford?